When the topic of divorce comes up, the conversation always seems to zero in on the combative and nasty accounts of people’s splits — because let’s be real, if there isn’t any drama, what is the point of telling or listening to the story in the first place? This can lead to a sort of competitive who-had-the-worst-divorce game where everyone tries to come up with their most vicious story. Except in this game, there are no winners. While this may be the common direction discussions goes, no one who has divorced wants to be in on such a match. Everyone would rather be in the boat where they came to the conclusion with their ex-spouse that the marriage wasn’t working, and they amicably decided to go their separate ways. While this may sound like some sort of fairy tale (and often times that is probably the case) there are steps you can take to try and have a more harmonious separation. The preliminary talk when bringing up divorce can dictate how the rest of the process will go. Obviously, if you are to the point of considering separating, this idea won’t be coming out of left field. Avoid bringing up divorce in the heat of an argument, because that will only serve to fan the flames of resentment and start the process off on the wrong foot. While it has been said before, I’m going to say it again: Despite the passionate emotions intrinsic to divorce, keeping a level head while talking to your spouse can make the process much less painful. This is true throughout the proceedings, and every conflict avoided increases the chance of a more cordial divorce. Coming to terms on disputed issues outside the courtroom will save a fortune on legal and attorney fees, as well as simplify the entire divorce process. Inevitably, you and your spouse will not be able to agree on all the aspects of a separation. You have likely spent years, if not decades, amassing things, money and many other assets that have to be split. If children are involved, an already complicated matters become even more convoluted. Figuring out who gets what is often the single matter that drags out divorce the longest, adding additional fees and attorney expenses. If you can manage to solve issues pertaining to money, property and custody outside of litigation, it will simply your divorce process and save you tons of time and loads of money. Going through mediation can also be effective if you cannot come to an agreement on your own, and it may just prevent these issues from turning into courtroom battles. Understand that the outcome of divorce is a compromise. You should not have an attitude of attempting to “win” the divorce. If that is how you feel, your spouse likely will return the favor, which will lead to a drawn out case of fighting over the smallest of details just for the sake of spite. This is costly both financially and emotionally. Divorce is about compromise, and trying to “win” will only serve to increase mutual resentment and lengthen the proceedings. Truly recognize that you aren’t going to come out of the separation with everything you had while you were married, minus a spouse. That is just a fact. There are going to be things you care about that will be left to your ex, just as there will be things she cares about awarded to you. Remaining rational and accepting that reality will simplify the proceeding, and if both of you can have this attitude, you can likely come to more agreeable arrangements than if you left the court to divide everything how they see fit. Things are just objects that can be purchased again later, so really ask yourself if it is worth extending the divorce just to get something that really doesn’t matter. It is easy during such an eventful and tumultuous point in your life to put little things on the back-burner while you focus on the larger and more pressing issues. With the emotional toll of divorce, it is crucial to take care of your mental health if the above steps are to be effective. You need some form of support to let out your frustrations and seek advice, otherwise keeping a calm state-of-mind will be nearly impossible. Whether it’s simply having supportive friends listen to you vent your heart out, or you seek professional help, releasing pent-up aggressions will help avoid a meltdown. It is also important to not to let the little things, like personal hygiene, fitness or other relationships, fall by the wayside. It can be easy to fall into bad habits like eating greasy cheeseburgers every day because you aren’t used to cooking, or skipping showers and the gym since you no longer need to look good for your wife. There are still other people you interact with daily, and becoming reclusive from your friends burns one of your main channels of support. The chances are if you are getting divorced, you have been unhappy for an extended period of time — the idea of ending a marriage doesn’t usually spring from those who are perfectly content. This feeling of unhappiness could stretch back years and may have been the norm for so long that you forgot what it’s like not being miserable. 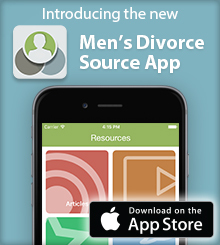 Now that you are divorcing, however, you get a second chance. While divorce can seem endless, it is really just the beginning of an opportunity for a fresh start. When you’re feeling bogged down, keep in mind that it won’t be long before you are looking back on your divorce from a new place in life. This is your opportunity to start over fresh, and in the larger scheme of things, the divorce process really doesn’t take that long. You will have a long road ahead of you, much longer than the months it generally takes to finalize a divorce, so keep that perspective in mind throughout the proceedings and don’t let the little things get to you. Remember that two years from now, you will be in a completely different place in life than you are now, and everything that is stressing you out now will be in the past. There may be new things that take their place, but that is future-you’s problem. No one expects to have a toxic divorce, but sometimes it may happen that way no matter what you attempt. But give these notions some thought: Even if all the steps fail miserably and you wind up with a “winning” story about your crazy ex, at least you gave it a shot. You never know, most people are rational individuals deep down — you probably wouldn’t have married someone if you thought they were a complete nut-job from the start. Perhaps if you are able to keep the appropriate perspective, it will rub off on your spouse. Even just a little will likely go a long way in some situations.